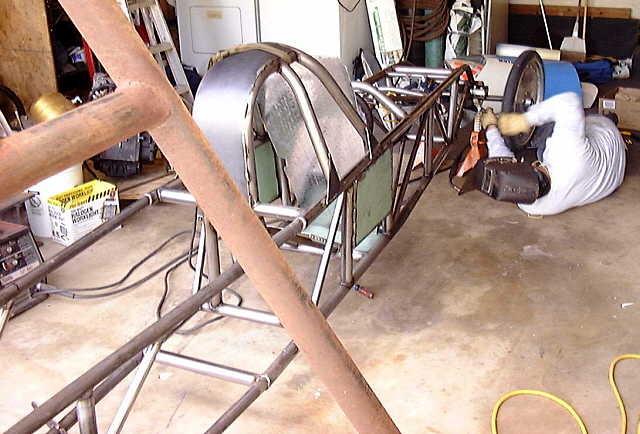 This page shows the early stages of the new Rice Vigeant Belly-tank Lakester. We started by stripping the old car, and only saving a few key items from it. 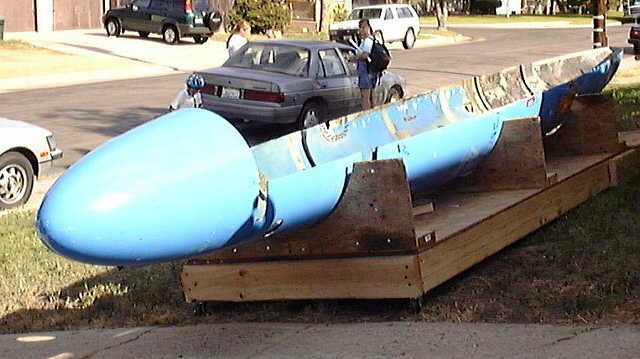 The biggest, and most obvious one was the lower half of the body, which we needed to keep in order to have a "belly-tank" lakester. 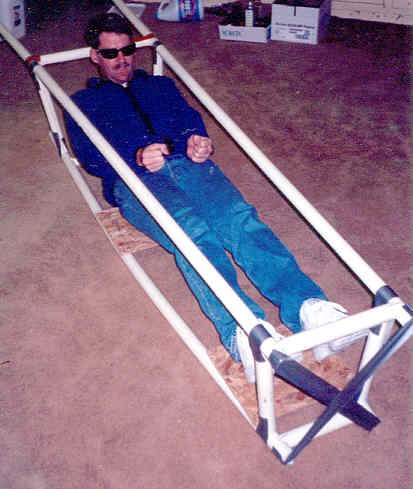 Here is the body, mounted in a wooden frame so that it wouldn't move while we assembled the rest of the car inside it. Before we could build the frame though, we needed get a good idea of what we wanted. 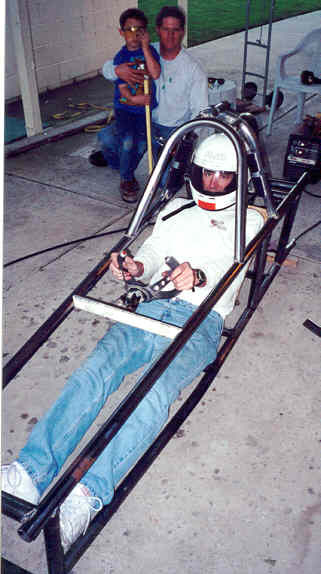 A quick trip to Home Depot for several sticks of PVC pipe and a hole saw, and we had simple roll cage we could try on for size. Please note the duct tape, and the clean garage floor. The duct tape you will see again, the clean garage, you will not. Our plan this time around was to build the car right, the FIRST time. That meant welding the cage in exactly the right shape. 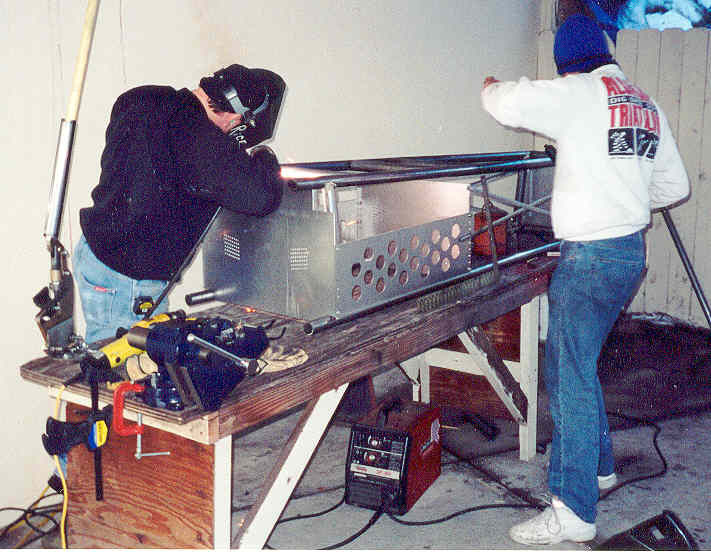 Since everything else would weld, bolt or fasten to this cage, we took a lot of time and effort to make it right. In fact, we started to joke we were putting more care and effort in pieces that were going to be thrown away, than we had into the old car. Case in point, the weld fixture shown above. 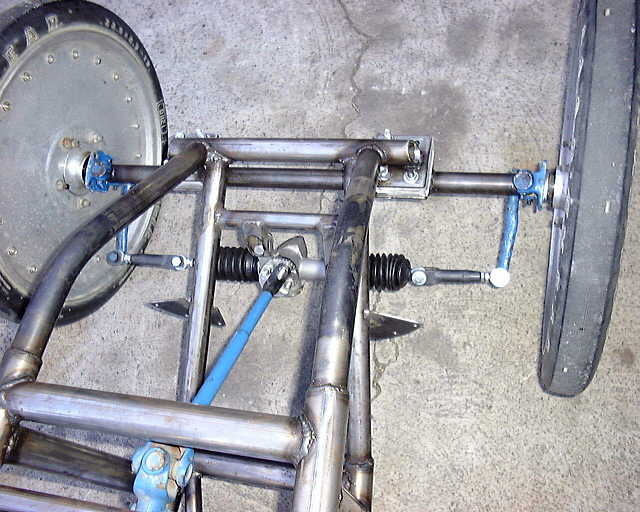 The sheet metal frames there were designed and built to hold 4 pipes in exactly the right shape. Once that shape had been welded, they were scrapped. Well, that's not entirely true. Some of them formed a temporary seat back until we made a real one. One of the big benefits of belonging to a car club is the additional resources available. We asked if anyone had a pipe notcher. There it is bolted to the work bench. It saved us several hours, and results were much better than we could have done without it. This is Alan trying out the cage for size. We found some problems and took it to another club member's house to have him do an inspection. Looking at his lakester, we saw how he had solved some of the same problems. See the green steel sheets below? Those plates give the driver 3 inches more width, and 1-1/2 inches lower seat. As You can see, the cage has progressed quite a ways. lots of triangle bracing and gussets. Time to add the front axle. Here is the new front end. The pieces in blue, were from the old car. everything else is new. This is basically what the car was like at the start of summer 2000. To see what happened next, follow this link: Mid 2000 or return to the main page, below.